Since its establishment by Friedrich Wamsler in Munich in 1875, the company has been a leading innovator in the field of kitchen and heating appliances. In the 1950s, for example, it developed the very first washing machine to incorporate an integral spin dryer and, in the 1970s, the company introduced a series of flat-packed gas fires. 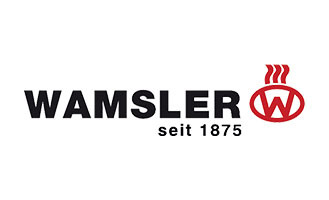 Today, however, the Wamsler name is primarily synonymous with the manufacture of solid fuel cookers and heating products which are sold throughout Europe. Every appliance, including those hand-built to order, is produced under the internationally recognised ISO 9001 Quality Management System as well as being inspected to Germany’s renowned DIN standards. Accordingly, your cooker, boiler or stove will enjoy not only a proven pedigree but also benefit from the latest production techniques. Accordingly, your cooker, boiler or stove will enjoy not only a proven pedigree but also benefit from the latest production techniques.